Our historic rock sanctuary sets the scene for traditional worship. We are a very warm and welcoming congregation and delight with each new person who comes through the door. There are no strangers here. We praise God with a mixture of traditional and contemporary hymns and songs. The service is fresh, relevant, engaging, and leaves one with an inspiring message and mission to take into the week. Coffee Fellowship in the fellowship hall after worship provides an opportunity for new comers to get to know some of the members of the church family. Pastor Kathy invites people to join her for lunch for time to time. You can enter the sanctuary from the front or the back. The front steps of the church, which are handicap accessible, lead to the front door of the sanctuary. If you would like to come up the back steps, you can walk in the back entrance where the church office is located and take the steps leading up to the back of the sanctuary. There are restrooms in the basement of the church and in the fellowship hall. 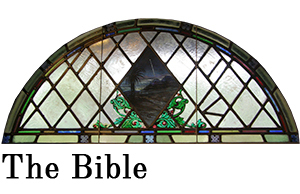 Weekly Sunday School is held at 10 a.m.
Weekly Bible Study meets every Wednesday, 3:00- 4:30 p.m.
Weekly Choir Practice is held on Wednesday, 5:00 – 6:15 p.m.
At Crossnore Presbyterian we use the New Revised Standard Version of the Bible for worship and Bible study.